Muslin curtain tracks are a great alternative for storing and using your muslin backdrops. If you’ve ever pulled a privacy curtain around a hospital bed you are already trained in the use of these types of tracks, and if you haven’t, we’re pretty sure you can get up to speed quickly (i.e. it’s pretty simple). Multiple muslins can be stored on one track, wrinkles are not an issue, and backdrops can be switched quickly and easily during photo shoots, allowing your creativity to flow. If you’re picturing both a useful and economical track in your studio, look at our 88001 privacy cubicle track. This track is equivalent to those used in muslin-track systems sold by many photography supply retailers at a higher price. This track comes in 6, 8, 12, and 16-foot sections and can even be spliced together for longer applications. It can be installed in “L” or “U” shape layouts to meet multiple creative needs, and can be mounted in standard ceilings, drop ceilings, or on the wall as your needs dictate. Premade curtains can be hung on the track using drapery hardware such as carrier hooks; but muslin cut from the fabric store can be hung with the use of hooks and bulldog clips. 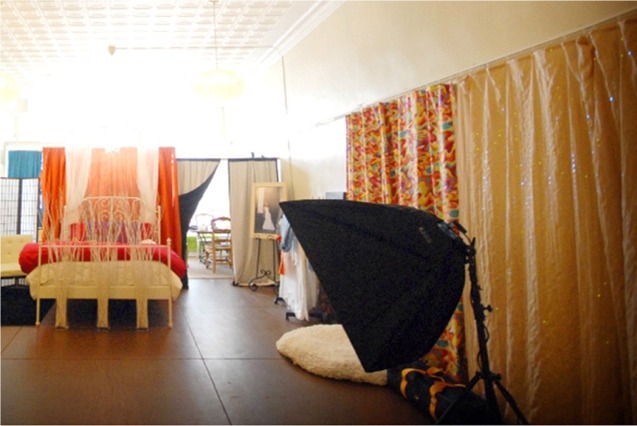 We enjoy helping photographers like you create an ideal studio space. Give us a call at 888-434-7444 and let us help you plan the best muslin track system for your needs.